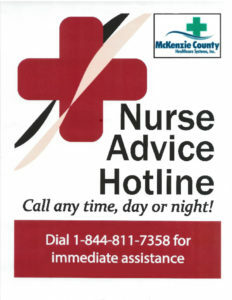 McKenzie County Healthcare Systems is anchored by a 24-bed Critical Access Hospital that is Medicare certified and a Level V Trauma Center in the Emergency Room. It is licensed by the state to provide skilled nursing care to everyone in need of care. We support a team approach to effectively and efficiently meet the needs of all our patients and their families. Our goal is to provide the best outcome for our patient by providing the best care possible. By using evidence based nursing care and ensure accountability in the decision making process. We offer many services. We have continuous cardiac monitoring, serial treatment option, acute care and outpatient observation, emergency room care, free blood pressure checks, and trauma care. Acute care services are for patients requiring care usually for 48 hours or more. Outpatient observation services are for patients requiring observation or care that requires a short stay of 48 hours or less.